Merthyr Running Club is proud to announce its official sponsor for 2018 will be local multi-franchise car dealership, Griffin Mill. 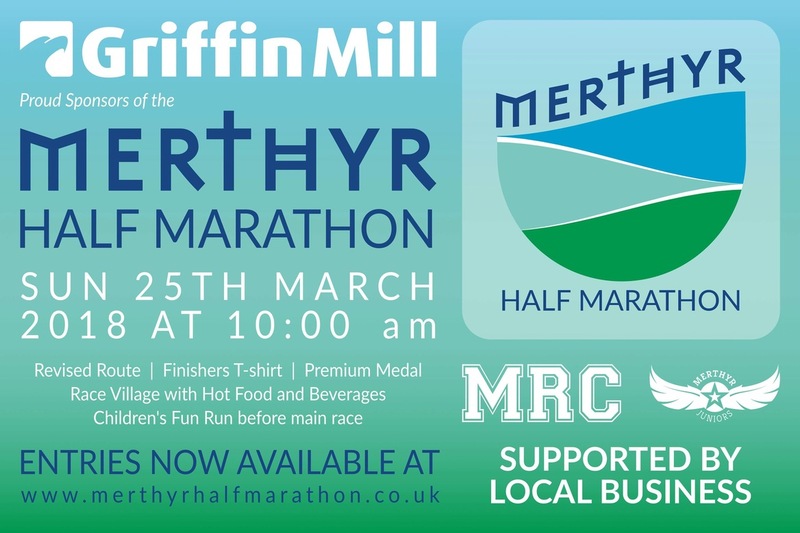 Merthyr Running Club would like to thank Griffin Mill for their support towards this event and are extremely happy to have them on-board! With the support of Griffin Mill, we are able to make this year’s event really special and are looking forward to working together to make the event a huge success. The route of the half marathon has changed this year. The run will start at 10am on the dot from Merthyr College and will head towards the historic Trevethick Trail for around 6 miles, before returning back up the Taff Trail and back to the college, where all that cross the finish line will be awarded a medal, T-shirt and goodie bag. This year, the event will be run by club members, runners and volunteers. It’s a non-profit race, and any funds made by the event will be reinvested into the Merthyr Running Club so that we can continue to put on fantastic events like this one – your support is very much appreciated. Currently, there is no facility within the Merthyr Tydfil area for junior runners, and we are therefore losing a lot of our talented young runners to neighbouring clubs. Merthyr Running Club wants to change that and we are more determined than ever to make sure our reinvestments into the Club are used to create such a facility – this event will be vital to make sure that this can happen. Our local hero and celebrity – Rainbow Warrior Mia Chambers – will be present, along with her family, to open the event. Five-year-old Mia has won the hearts of thousands of local people, and we are thrilled that she has agreed to come along on the day. The deadline for entries to run the half marathon is Saturday 24th March. Entries can be made in advance only and places are going quickly, so don’t miss your chance to sign up if you haven’t done so yet! We’re inviting beginners to join us in this run too, and Merthyr Running Club can help you to train for it. We run three times a week and have specific half marathon training runs planned for every Sunday in the run-up to this event, so do get in touch if you would like to take part but need support with your training. We are also inviting supporters of all ages to come along and cheer on the runners. There will even be a Children’s Fun Run before the main event, and children can enter on the day. We are extremely excited about this year’s race and are determined that this year will be the best yet with the help of main sponsor Griffin Mill and our other local supporters. The team is putting in lots of effort to make this event different, so expect some surprises in store as you run around the route. Our water stations are being supported by the local gyms in the area, and will be competing with each other for the best one, with runners able to vote for their favourite at the end. It’s a very proud day for Merthyr Running Club and we want to appeal to everyone in Merthyr Tydfil and the local area to come along and support the day, as it’s going to be a great day out for the whole family. Our aim is to encourage all runners – no matter what their level of ability – to come along to our fantastic town and experience a half marathon that will be extremely well-supported.